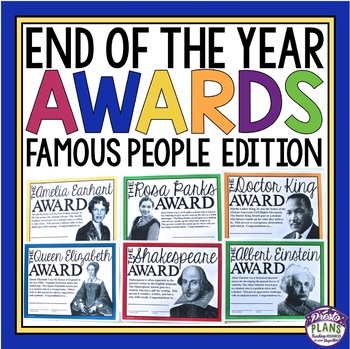 END OF THE YEAR AWARDS: End your school year by giving your students these 30 ready-to-print awards inspired by famous and influential people in history! Each of the awards is named after a famous person and a detailed explanation for why the student is receiving the award is included on the certificate. All you have to do is print, sign/date, and you are done. Click the preview button under the product images to see a few examples of the awards! SAVE BY PURCHASING THIS RESOURCE IN A BUNDLE. CLICK BELOW! 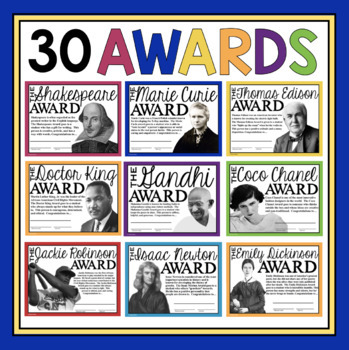 Also included is a Powerpoint version that allows you to type student names directly onto the awards! 2 blank versions are included incase you would like to add any awards. A list of the awards is also included, so you can easily assign students to a particular award. ♥ I love this set of awards. It's great that it offers variety and shifts attention from grades to the student, and it compares them to a famous person who's done something great. ♥ I LOVE these! Thanks for creating them! Truly, the most cleverly designed awards I've ever seen! ♥ What an awesome idea! 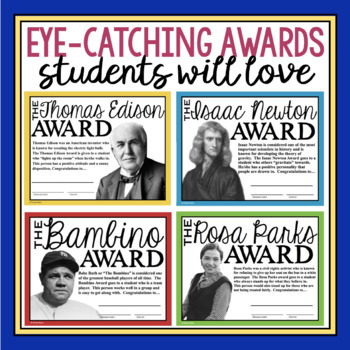 I love the unique spin you have taken on End of the Year awards and made them personalized and meaningful for students. Scrolling through the examples, I already knew which students would receive which award based on your clear descriptions. Thanks for creating such an engaging product and one that my students will love! ♥ These are super cool! Can't wait to use them. I plan to use at the end of the school year in each class. Thanks for coming up with the great idea!!!!! ♥ Thank you! Thank you! Thank you! I gave these out during the last week of school. I loved being able to give every student an award for something different -- and they, even as high school students, were so happy to receive them. Plus, you made it so easy to do!